And I survived it. I walked up the hill. And I walked back down the curvy hill. And that’s an accomplishment. Before the fibro, I walked four miles a day, I did yoga and an ab-workout thing. I could walk circles around my kids and the spouse. Then, in 2005, I started to feel sluggish. I thought it was my thyroid acting up. (I have a thyroid condition). Tests showed it wasn’t. I slowed from four miles to three a day. Then two. Then one. Then when I got to where I couldn’t crank out even a half mile, I stopped walking for exercise. In the middle of all that, I stopped doing the yoga and the ab-workout. Of course, the weight came on. I gained sixty pounds that first year. They tested me for everything. In that first year, the pain started. Joint pain, body aching pain. And so tired. So very tired. A doctor increased my thyroid medicine and I started to feel better. I started to walk again- a short distance, a mile. 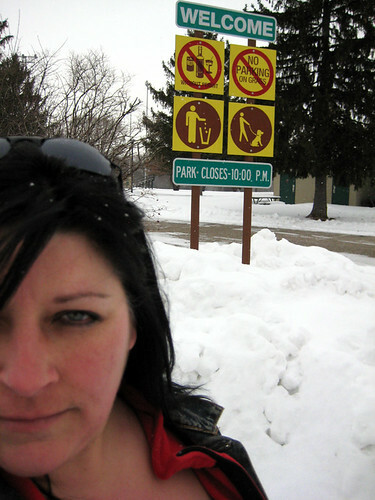 March 3, 2006, I slipped on the ice on my back deck and tore up my knee (again). That set off a two and a half year saga to get a consultation letter from the doctor to see a non-VA surgeon. I went from crutches to a cane following that injury. Then I walked with two canes. That was the VA’s solution for me when both knees were bad. Give me two canes. I named them George and Gracie (the cane I had already, his name is Hank and he’s made of wood, George and Gracie were "old-people canes", metal with the ergonomic handle). For almost two years, I walked with two canes when I had to go further than the distance inside my own house. I looked like a fat, weird robot. On March 18, 2009, three years after I hurt my knee, I got a knee replacement. I named the metal joint "Steve Austin" and the scar is named "Fronkensteen". That surgery kicked off a fibro flare-up that was too obvious to deny. But it took another year and three months to get a proper diagnosis. I was officially diagnosed with fibromyalgia on June 28, 2010. And now I take medicine to cope. I’ve been taking Vicodin for years now- for the pain. In July 2010, I started taking Cyclobenzaprine (a muscle relaxer) and it helped a lot. But after six months, the rheumatologist didn’t think it was helping enough. Now I take Gabapentin. One week at one pill a day, then move up to two. After a week of two pills a day, I tried three (a week ago, in fact) and I felt like a drooling zombie. So I went back to two pills a day. . This day, this walk… I took a pill in the midday again to see if it would zombie me out again. I did not. I feel a bit of a buzz, but not completely looped out of my head. And… I walked today. On a walk. Uphill. And the only thing that really caused me pain was my feet. (on top of it all, I have foot problems too). Its a start. Let’s see if I can keep it up. I have fibromyalgia. And like most of you, I thought it was a made-up disease that people just used to label something they didn’t understand, but guess what, it’s real and it bloody well hurts. It took five years, total, to get a diagnosis- two of those years were spent with an awful doctor who didn’t care about anything other than maintenance of my other health stuff (like blood pressure and such). I could turn this into a blog post about how he blamed everything on my weight, except for the fact my weight was fine till the pain set in, but I won’t. This is about fibro and it hurts. It turns out, many of my family members have the same problem. In the late 80s, my mother and her four siblings had a biopsy done to try and identify the "unnamed nerve disorder" they all had. My cousin (older than I am) also had the biopsy. All of them had the same "unnamed nerve disorder". It was described as "the nerves attacking the body…" All the biopsies showed was that they had the same thing. I’ve never had a biopsy, but I have a real doctor’s diagnosis. As did my cousin, who was six months younger than me. (she passed away almost two years ago- not from fibro, because it doesn’t kill you). On a good day, my pain level is at a 3 or 4 (on that 1 to 10 pain scale). And if the pain alone wasn’t enough- because I can deal with pain, I have been for so long- I’m exhausted. And I’m not saying "tired", I’m exhausted. You know how you feel at the end of a hard day’s work? That is how I feel most of the time. I feel like I’ve just walked five miles or chopped wood for two hours. And all I’ve done is get out of bed and come downstairs. On bad days, my pain brings tears to my eyes. On those days, my physical exhaustion is so bad I have trouble sitting upright. My skin hurts- you know when you’re coming down with the flu and the water from the shower hurts your skin? That’s how it hurts. If I’m lucky, that’s all I have with my skin because sometimes, my skin will itch. From inside. Scratching does nothing but make it hurt. My bad days are fewer now that I’ve been getting treated for this very real, very painful disorder. Most of the time, though, my days are between the good and bad. Like today. I’m up, I’m showered and dressed, but my clothes hurt my skin. It took me almost two hours to get showered, blow-dried, and then dressed. I had to rest between each task. I took this photo between the blow-drying and the getting dressed. (I was looking at the TV, which had an episode of "Law & Order CI" I hadn’t seen all the way through). At the moment (as I type this), I’m resting at my desk (which can be tiring) then I’m going to make something for lunch, take my midday fibro pill and then go run errands. And I’ll be down for the count when I get back because that might just push my middle-day to a bad-day. But for now- I’m up. I’m dressed. I’ve got my boots on. And I’d rather be under that soft fleece blanket. I gave the disabled guy a bunch of crap about that blanket. He got it for me in October, while he was in NC and then waited till Christmas to give it to me. He gave me two- this one (with a wolf on it) and another with an eagle on it. I told him he could have the eagle one for the living room- because that’s what he wanted all along. I also told him he could have just given them to me when he got back from NC. I love this blanket because its soft and it is just the right weight to lay over me without hurting me. 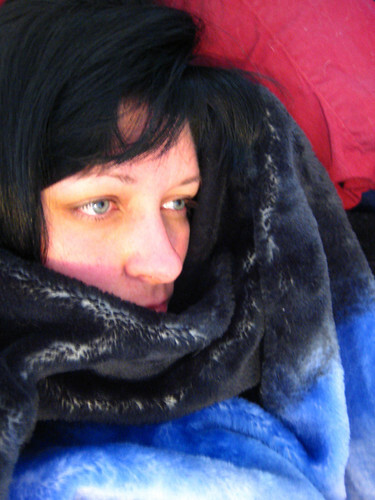 And yes, I’m naked under this blanket because that’s the best way to be with fibro and a soft blanket.